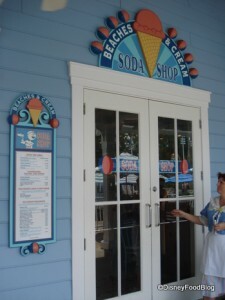 Ah, Beaches and Cream — this is THE place to go for burgers and ice cream sundaes in Walt Disney World. Tucked between the Yacht Club and Beach Club Resorts, this authentic soda counter restaurant is decked out in pastels and is serving up some great ice cream. This is a short menu, but it has everything you need: burgers, fries, veggie burgers (not on menu but usually available by request), pot roast sandwich, turkey club, hot dogs, and all the ice cream you can eat. (Click here to see a post that includes photos of the whole menu.) Note that the menu has changed and some items are no longer available. Beaches and Cream is now taking reservations! Going with a group? Try the Beaches and Cream Kitchen Sink! If the wait is long, consider getting some ice cream to go and sit at the tables outside. Be sure to ask for a flavored Coke! You can get vanilla, chocolate, raspberry, and even cherry! You’ve GOT to See the NEW Over-the-Top Milkshakes at Disney World’s Beaches and Cream!